Last Sunday at church we had a special offering for the Oaks of Mamre, Guymon’s homeless shelter. It is on Super Bowl Sunday each year because that is the day the Oaks Board holds their Souper Bowl fund raiser. Our special offering was giving in pots. It is good to do. The Psalm reading came from chapter 112, “Light shines in the darkness for the upright; the righteous are merciful and full of compassion. It is good for them to be generous in lending and to manage their affairs with justice. …they have given freely to the poor, and their righteousness stands fast forever; they will hold up their head with honor. Wow. It was like the church readings were chosen especially for the Oaks offering. Gibbs on NCIS says there are no coincidences. Pretty straightforward, don’t you think? Yes, I gave to the Oaks. No way I wasn’t going to after hearing and reading the readings. You know, if you haven’t, you still can. The Oaks does good work and they should be blessed by us. 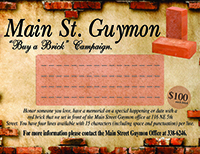 Another blessing is a meeting at Main Street Guymon on Feb. 20 for veterans. Any and all veterans are invited to come and discuss benefits, health concerns, and life concerns. It is to be at 5:30 pm in the Main Street Guymon office at 116 NE Fifth Street. Hope to see you there! Then on Feb. 22 is the free Heart Healthy Luncheon for women (dress in red if you can) at 11:30 at the Methodist Enrichment Center at 6th and Quinn. Women have the chance to get their blood pressure, BMI, sugar and cholesterol tested free. And after having those tests, you will be in the drawing for a red Brighton purse. The next evening, Feb. 23, is the Main Street Guymon Awards evening. Virgil Gibson is catering and we are honoring some fabulous businesses and individuals. Hope you’ll come to it. The tickets are $25 a person and it is held at the RC Party Room at 5th and Main. Be blessed and see you on the bricks!